The battle for the ‘my kilowatts are more than yours’ prize in the hotly contested double cab segment is officially on with the reveal of VW’s uprated 190kW V6 Amarok. We drove it in Oman, on a three-day desert adventure. Bakkie wars are a very real phenomenon. Fire is exchanged largely on social media where faceless ‘warriors’ shoot off their mouths about exactly which make and model is more powerful, is the fastest, has better load capacity and so on. It’s gets pretty nasty at times. So, when it was announced that Mercedes-Benz’s new X350d with a V6 turbodiesel engine with 190kW and 550Nm was on its way, it was only a question of time before rivals companies responded. Volkswagen is now the first company to take on the perceived threat of the X350d. The 165kW/550Nm has now been updated to deliver 190kW and 580Nm. Like in the 165kW version, there’s 10kW of power available for up to 10 seconds on overboost situations, like overtaking. So that’s a total of 200kW. That torque peak of 580Nm is available from 1 400 to 3 000r/min. 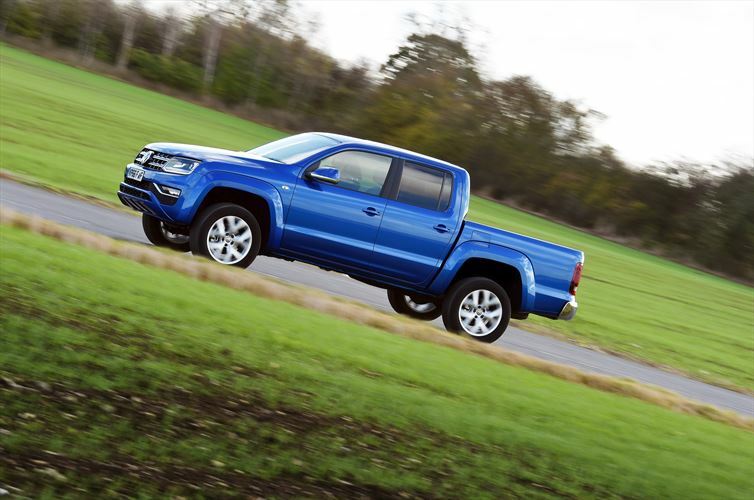 The updated 190kW Amarok will be landing in South Africa in the second quarter of next year. 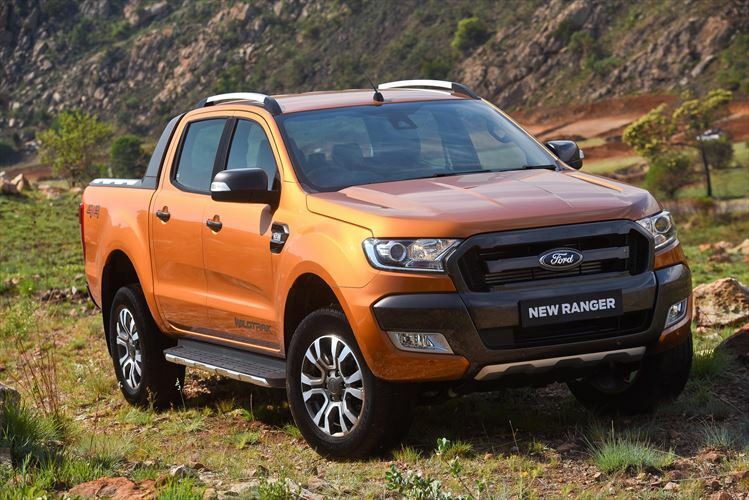 Before we got to test out the new powerhouse 190kW V6 Amarok engine, coupled to an excellent eight-speed auto transmission with standard 4Motion permanent all-wheel-drive, we drove a manual Amarok variant, which is not available in South Africa. This detuned version of the V6 TDI delivers 120kW, and is mated with a six-speed manual transmission. Our unit came in Tornado Red, in the Trendline trim. I was seated in the passenger seat until after our lunch stop, after which I took the wheel of a left-hand drive manual for the first time: to drive up the incredibly steep Eastern Al Hajar Mountains that lead to the Salma Plateau. Before my first driving stint, I inspected the cabin from the front passenger seat and found the Trendline interior to be sufficient enough when it comes to comfort, although it doesn’t excel in this area in the same manner that the Aventura trim does, which we experienced next. Still the Trendline version was comfortable enough and came with the vital air con and USB ports to charge our phones and devices. Our group set off from Muscat and travelled south along the coast on well-maintained highways. The road infrastructure in Oman is quite impressive and after a smooth tar-ride on the 20-inch wheels, we finally reached some dirt when we got to the Ras Al Shajar Nature Reserve. Waheed Al Fazari, a local biologist, accompanied our group and he spent some time explaining which creatures we could expect to see in this barren, rock-strewn reserve that hugs the coastline along the Arabian Sea. A few shrubs cling to life in these parts and provide nourishment to the rare Arabian gazelle. With four-wheel-drive engaged, we trundled over the hard rocky ground and spotted a herd of these, which look a bit like bleached springbok, as we headed towards the white sand of Fins Beach. We also came across some wild donkeys on our drive and endangered Egyptian vultures circled overhead with their dramatic black and white wings silhouetted against the sky. We stopped at Fins for lunch and a dip in the Arabian Sea, also known as the Sea of Oman, as the mercury climbed to 38ºC – par for the course for spring in this arid land. After we had eaten, it was my turn behind the wheel and we headed for the Salma Plateau, a vertical climb of note, from sea level to 1 700m over the distance of five kilometres, through the mountains. The dirt road wound tightly up. At some points, the hairpin corners were so steep that whoever is in charge of roads in these parts saw the need to pave a few of them with concrete. We can compare it to driving up some of the driveways of homes set on the mountainside, like Fresnaye or Higgovale on Table Mountain, except that instead of one acclivitous driveway at an acute angle, there were what felt like hundreds (although it was probably more like 40). The Amarok didn’t miss a beat. I did however. . . I stalled the Amarok a few times as I rounded a steep corner and needed to drop down from second to first. Instinctively, my left hand shot out to change gears, however I found myself swiping thin air, as the gear lever was waiting patiently for me on the right hand side. Once I had repeated this mistake a couple of times, I got the hang of the left-hand drive bakkie and we sailed up through the dramatic scenery, heading higher and higher. The ‘Rok was quite capable of climbing the near vertical bits in these mountains in first and second gear without the need for low range (which the manual version does have, unlike the automatic variants). Just like when hiking up the mountains, there were so many false summits, each time I came around the corner expecting to be on top, there was another peak and the switchbacks kept twisting up from left to right and back again. The vehicle was fitted with grippy BFGoodrich AT tyres, perfect for these conditions. Eventually we did reach the plateau, with a flat expanse in front of us. Reaching the summit of those mountains, even in such a capable machine, felt like a true accomplishment. Our convoy of Amaroks came to a halt and we climbed out for a photo stop. There was calmness on the plateau as blue tinted clouds hinted at the coming thunderstorm. We drove down for a short while across the plateau to reach the Majlis al Jinn (Meeting Place of the Spirits), one of the largest cave chambers in the world, which lies at 1 380m above sea level. A few years ago, Austrian skydiver, base jumper and daredevil, Felix Baumgartner – he’s the guy who parachuted from space down to Earth recently – did a very daring base jump into the Majlis al Jinn (you can view a video of the jump online at youtube.com/watch?v=jgo_wVDOiTI ). We stood gingerly on the edge of the gaping hole in the Earth, there are no railings to stop you from going over the edge and I wondered how many camel, donkey and goat bones lay at the bottom. We left Majlis al Jinn before it threatened to swallow us and the whole contingent of Amaroks into its dark subterranean belly, and drove on. The plateau is devoid of vegetation besides some stunted, dry looking shrubs sprinkled very sparingly on top. The tufts of Karoo bossies that huddle together back home could be considered rather profuse when compared to this. Fine sand on a hard-packed surface made up our road and we meandered more gently through this curious landscape. Finally we came to a large open area littered with small squarish rocks overlooking the mountains laid out below. This would be our camp for the night. The next day we would be heading to the desert proper. After breakfast, our convoy of Amaroks snaked its way down from the plateau, through a small town before we headed through more dramatic rocky terrain encircled by jagged mountains. Here we got a chance to drive in dry riverbeds over some smooth stones and on a mixture of dirt, sand and gravel. Again, the Amarok was stellar in its ability. After enjoying the rugged byway, we headed up a pass with tar that was almost as smooth as the surface of a polished bowling alley. The Amaroks sailed up despite the sometimes extremely steep angle and some well sign-posted tight corners, and headed towards Wadi Bani Khalid. This is an oasis, where a river lined with thickets of palm groves leads to a pool surrounded by jagged hilltops and mountains. The parking area was the busiest we’d seen outside of Muscat, with all sorts of vehicles, mainly 4x4s, parked in a long line. It seems like VW has not yet captured the Omani market but our colourful convoy sure made a statement and I’m sure they piqued the locals’ curiosity in a way that may change that in future. The oasis area must be large because although we saw other people, it did not feel crowded at all. The wadi beckoned and after a refreshing lunch stop and dip in the clear water, we eagerly took the wheel of the 190kW V6 Amarok and headed to the town of Bidiyah, the last outpost before the desert, to deflate the vehicles’ tyres. The 190kW, 3.0-litre V6 TDI purred quietly under the bonnet so quietly we hardly noticed it was alive. Perhaps the fact that this engine is also fitted to the Porsche Cayenne and Audi Q7 meant that it had to have a level of decorum. Refined yet Herculean at the same time. 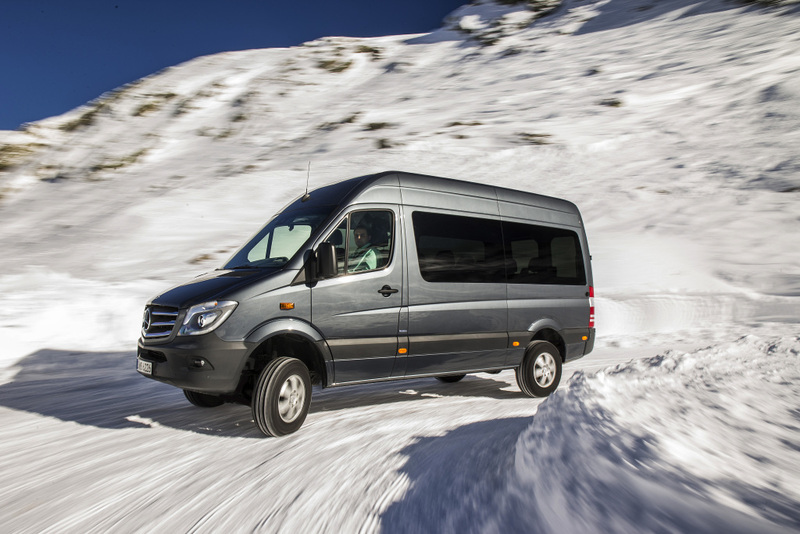 The NVH levels were also excellent, making the cabin — which was kitted out in leather and top-of-the-range Aventura trim — a luxurious haven that protected us from the harsh desert climate. This Aventura Amarok model also features new visual elements, such as a black roof liner, new 20-inch wheels and the option of paintwork in metallic ‘peacock green’, a first for the Amarok. Ours came in the appealing Ravennenblau (blue). It was almost surreal, as we left the Bidiyah, which lies right on the edge of the desert, but there were houses dotted here and there surrounded completely by sand. A few hundred metres later, we left civilisation behind and headed towards a group of Bedouin people who loaded a camel into the back of one of the Amaroks just to show us how the ship of the desert gets transported these days. Later, completely unscripted, we come across a man driving though a more remote part of the desert with a camel in the back of his bakkie, confirming that this is not unusual. We suppose you could compare it to the South African farmer transporting couple of sheep across his farm. We sped off on a sand highway – a set of tracks in the sand in a valley that runs parallel to long elongated dunes on either side – deeper and deeper into the desert. It was exhilarating keeping up with the convoy that seemed to turn this leg into a time trial: the V6 seemed to revel in it all and propelled us along effortlessly. Before we reached the desert camp, we had a quick briefing and another reminder to ensure that traction control was off and four-wheel drive engaged (for those units without permanent 4Motion) before it was time to tackle a rather steep dune. Success! The line of Amaroks powered up the shifting mountain of sand one after the other with our 190kW V6 not breaking a sweat. We then cruised along the top of the dune for a good few hundred metres before we headed back down into the valley to do it again. After this taste of dune driving, we headed to our digs for the night ahead of the next day’s outing to the playground of sand. As we gathered around the vehicles at 8am, the mercury was already at above 30ºC, thanks goodness for the Amarok’s effective air-conditioning system, which kept us happy (and alive) as we travelled. I hopped behind the wheel and spent a glorious morning powering up, over, though and round the undulating tracks that fed though the sandy hills. Eventually we came to a sand ‘runway’ that would allow us to gain the momentum needed to tackle the monster dune that lay ahead. We were cautioned to make sure that we had enough speed leading up to the dune and then to give it ‘more throttle’ as we climbed. One by one the V6 Amaroks flew across the sandy plain before launching up the wall of sand. Each one made it, with the excited shouts of, “More throttle, more throttle!” coming over the radios with a heavy German accent from the Volkswagen 4×4 sand driving expert, egging them on. Being naturally a little more cautious than some of the guys I’ve witnessed, and as the only female journalist in the group, I decided to make an effort to floor it across the plain ensuring I had enough speed when I reached the dune. I was clearly going at quite a lick as the voice over the radio said for the first time, “You can slow down a little here”. I eased off the throttle just a tad and then up, up and up I went until I reached what I thought was the crest of the dune where I once again eased off a little. In fact, I had not quite reached the top and so came the encouragement, “More throttle, more throttle!” I gave it more throttle but just didn’t quite get it right. “No throttle, no throttle!” came the instruction, somehow all I heard was “Throttle, throttle!” and so I powered the wheels deeper into the sand. Stuck. I was the first and only one of our group of journos to get stuck. Ouch. I don’t have that much pride but mine was hurt. I was reassured that many others had gotten stuck (although not in this group of savvy South African and German 4x4ers) and then it was all hands on deck to help me out. 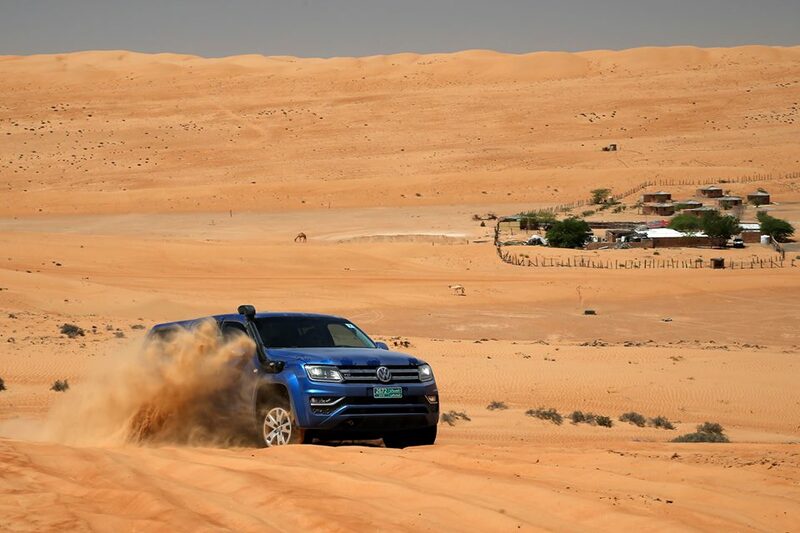 After we all did some scooping of sand, local guide Jaafar Al Toubi hopped behind the wheel and launched the Amarok out of its trap. Thankful, I returned to the helm. We headed down the other side of the dune and soon we arrived at what was described as the sand playground. Here we delighted in driving over a series of smaller dunes to reach the top of a steep sand mountain that we could tackle going down. It was quite a thrill and the Amarok once again performed beautifully. After we finished playing, we headed back to the town of Bidiyah to reinflate the bakkies’ tyres, get back on the tar and we head north via Zukait to Muscat again. This 190kW double cab accelerates like a dream, corners well and the eight-speed auto box impressed us throughout. Although the automatic Amaroks don’t come with a low range transfer case, the first gear is very low to compensate and it certainly did a stellar job off-road. We covered about 1 000km over the three days and the solid build of the Amarok impressed us as. This convoy of V6s had been driven hard over extremely rugged terrain in the desert heat repeatedly (we were the fifth of six international groups that were testing these vehicles over three days each) and there was not even the slightest rattle, and certainly no technical issues. 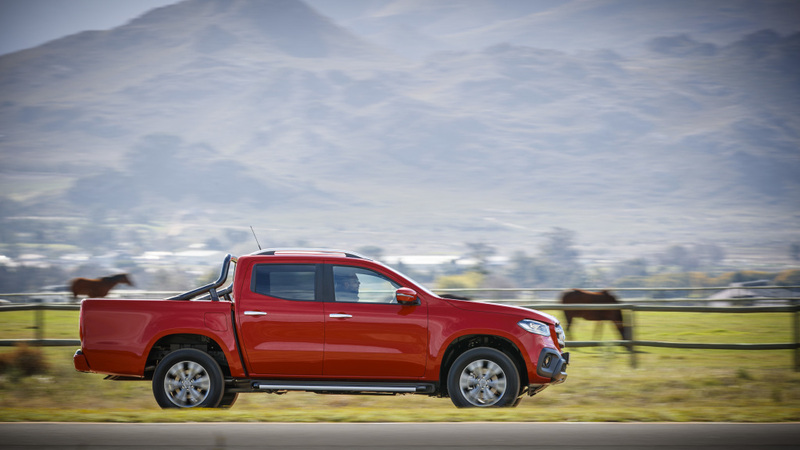 Hooray for the bakkie wars! We’re not sure which one will win next, but for now the 190kW VW Amarok is top of the heap. Average temperature in Muscat in April: 30ºC, reaching an average high of 35ºC in the peak of the afternoon and 25ºC at night. Currency: Omani rial and one OMR is equivalent to R31. The Sultanate of Oman is an absolute monarchy: It is ruled by 77-year-old Sultan Qaboos bin Said bin Taimur Al Said. He has been head of state, head of government and commander-in-chief since 1970. The national consultative council has an advisory function only. It is partially elected, but ultimately compiled according to the will of the Sultan. There are no political parties (these are banned) and the legal system follows Islamic law. The thumbs-up gesture is considered obscene. It is impolite to point one’s feet at another person, so you should avoid crossing your legs when sitting on a chair (we all forgot from time to time). Female tourists – unlike local women – can eat in a restaurant together with men. Men should not speak to women they do not know in public, except in customer service.